It's the very last medal day for track cycling! 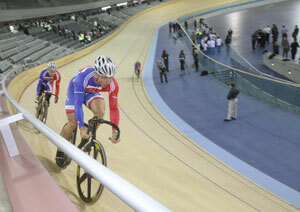 If you've been watching, you'll have noticed just how steeply the elegant wooden cycling track is banked in the turns. Echoing this shape is the sweeping curved roof of the Velodrome (which hit the headlines in its own right during the torrential rain this weekend) topping the beautiful cedar clad exterior. To find out why and how the track and its buildings came to have the shapes they do, read the Plus articles Leaning into 2012 and How the velodrome found its form.